Cherries seem to be all the rage at the grocery store and I couldn't pass up a good sale. With a bag of cherries sitting on my counter, I wanted to use them creatively (although it certainly would have been fine eating them right out of the bag.) Joel was on an ice cream kick and it was a great opportunity to take out the ice cream maker and show him how homemade ice cream was made. He loved helping whisk the ice cream mixture and watching it churn in the ice cream maker. I often forget how much kids enjoy the littlest things! Just before the mixture was ready to transfer to our ice cream freezing container, we added the cherries and chocolate chips so they could be swirled in throughout. Finally, when we enjoyed our ice cream creation the next day, he was already asking to make more flavors! The original recipe was from Ben & Jerry's ice cream cookbook and included only almonds. I opted to omit the almonds and use fresh cherries and chocolate chips instead. The swiss chocolate base recipe is great to build on so you can really go wild by substituting whatever you'd like for the cherries and chocolate chips. If anything, just make sure you have only a combined amount of 1 cup of add ins so that there is a nice balance of ice cream to goodies. Another tip: if you have an ice cream maker, it helps to have at least 2 freezer bowls to keep the ice cream making momentum going! Have a wonderful, safe and delicious July 4th Holiday Weekend! In a large mixing bowl, whisk the eggs until light and fluffy. Whisk in the sugar, a tablespoon at a time, then continue whisking until completely blended, about 1 minute more. Add the espresso powder and cocoa powder, continuing to whisk until blended. Add the heavy cream and milk, continuing to whisk until blended. Transfer the mixture to an ice cream maker and freeze following the manufacturer's directions. 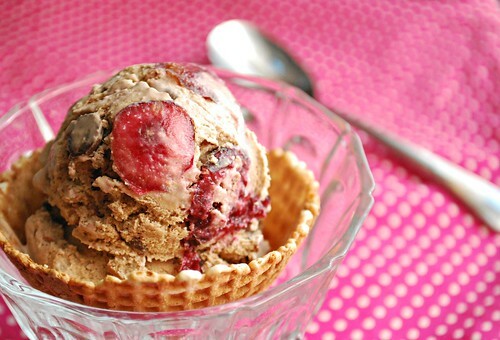 After the ice cream stiffens (about 2 minutes before it is done), add the cherries and chocolate chips to incorporate. Transfer ice cream mixer into a freezer safe container and cover, freezing for at least 3 hours or better yet, overnight. I think this sounds like heaven in a bowl. great job!